Make hand sanitizer spray with this easy recipe below. All natural, non-toxic and healthy for you and the environment. Hand sanitizers have become very popular over the last years. With advertising campaigns convincing people that it is necessary to continually sanitize your hands and everything that you touch. The store shelves are now full of hand sanitizer sprays in bottles of all shapes and sizes, many people carrying a bottle with them everywhere they go. But is all this hand sanitization really necessary? And are all the hand sanitizers sold in stores made with healthy ingredients? Everything fights for survival - even germs and viruses. If you continually bombard your system with synthetic antibacterials you will be creating an environment where the creation of superbugs may exist... superbugs that won't respond to conventional medicines. The overuse of synthetic hand sanitizers disrupt our own bodies defense mechanisms against invaders by, not only, affecting the acid mantle on our skin but also affecting our immune system. Many commercial hand sanitizers contain unhealthy and potentially damaging ingredients including triclosan, fragrances and propylene glycol. Don't put anything on your body that you wouldn't want in your body. If you can't pronounce the ingredients listed and you don't know what those items are, be wary. Everything you put on your skin ends up in your body too. Make use of the EWG website where you can look up many popular brands and see how healthy they are rated as well as reading more about each ingredient listed. Many of these commercially made hand sanitizers will affect the good bacteria we have living within us all - the stuff that keeps us healthy. If those good guys get destroyed, everything else our body tries to do to keep us well becomes harder. Our skin has a natural acid mantle that is one of our bodies defense mechanisms. Continually using synthetic hand sanitizers will compromise this acid mantle thereby disabling one of your own natural defenses against germs and other outside invaders - the exact opposite of the purpose of sanitizing!! But Isn't it Necessary to Sanitize our Hands? My answer to this is, everything must be done in balance. Too much of anything can be bad, even a good thing. Keep yourself clean but don't go overboard and avoid anything that isn't made with healthy, natural and organic ingredients. Our bodies are constantly trying to keep us in balance, by overusing hand sanitizers you throw off the balance your body is fighting to keep. Use a hand sanitizer spray like the one in the recipe below. Or shop for one that is made with only healthy ingredients. Do not overuse your hand sanitizer spray. 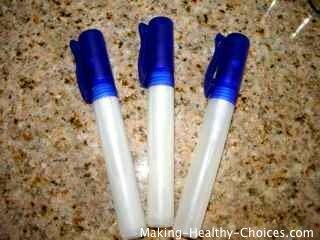 Below is a hand sanitizer that you can easily make at home. Spray once into the palm of one hand and rub hands together. Bring your hands to your nose and inhale deeply. This allows you to further benefit from the healthy effects of the essential oils. Add the tea tree essential oil. Then add 7 drops of Yling Ylang essential oil and top up with good quality water. Yling ylang provides a wonderfully soft floral essence. Then top up with lemongrass hydrosol instead of water. Enjoy this gorgeous lemony scented hand sanitizer spray. Use different combinations of your favourite essential oils to create the scent that you love. Try using the Thieves Oil Blend for a very effective hand sanitizer. Be sure to only use good quality therapeutic grade essential oils. Lemongrass Hydrosol has antidepressant qualities and helps to promote mental alertness. There are also antiseptic, antioxidant and astringent properties present. And most easily noticed are its amazing beautiful aromatic tones.